Alright, so here's where I clarify something. My Diamond version has all the pokemon on it that I'll be offering up. Even Dialga, but whatever I'm looking for I'm wanting to get put on my SoulSilver. It's nothing too major of a snag, it just means you send junk pokemon to my Diamond version for what you agreed upon receiving, and then give me a few minutes to switch to SoulSilver and then I trade you junk pokemon for what I agreed upon receiving. The reason for this is that I don't have to DS's of any sort so all the pokemon that I might want off of Diamond are just sitting there for nothing, since I'm focusing more on SoulSilver. Also, while we're talking about what's to offer, if you're looking for babies of a certain kind or something, after I establish a bit of a basis of pokemon on SoulSilver, I might start breeding to help my trading. For instance I'm breeding Totodile at the moment, next maybe Scyther and Onix. Then maybe Ryhorn and Kangaskhan. The point is if you want a baby pokemon of a certain kind, ask away and I'll see if I can do anything for you. I restarted, so I'll get back to this after I beat Red. So, let me explain this one a bit, there are some Event pokemon I'd like to keep, but there are some others I just need some help with. For example, I need help getting the Spiky-eared Pichu. So I need a Shiny event Pichu temporarily to do that, but of course if you don't really want that Shiny Pichu or you think I've got something that you'd rather have, I wouldn't have a problem keeping it as long as you got what you want as well. Currently I'm getting as many Event Pokemon from Nintendo WFC as I can, right now I've got Raikou and Entei [two Entei, one on my diamond, so it's pretty much trash. But I would rather give it away for something of equal value]. And I'll be getting two Suicune as well. One thing, is that I'm currently in the works of making a pseudo-Ash's Pikachu. As of right now I don't have very many wants or needs to do with Event Pokemon, but when I'd like to get something of equal worth when I trade them to someone, even if I am trading doubles. Right now I've got two trades waiting in the wings, two Shiny pokemon for some doubles of my event pokemon. But if you think you can make a better offer to me, please do. And as usual PM me with details and all of that good stuff. That's it for now. When the 5th generation games hit the states I'll start looking for certain pokemon out of them, but until then I'll wait. I'm available on MSN, YIM, AIM also if you've got those and would rather instant message than have to wait for a message to pop up on your screen. An old team I had an idea for. Criticism is appreciated. Last edited by Elrik on Thu May 05, 2011 8:21 pm, edited 15 times in total. to answer your first question: if your scyther is level 1, and you attach the metal coat and trade it, it should learn the move. If you have a higher level scyther, it will cost you a heart scale. You'll have to evolve your scyther and then take it to the move tutor to learn bullet punch. I should be free to trade this weekend, PM me with when is good for you, the FC you'll be using, what you're offering for the pokes if you're interested in them. I can get you a baby Cyndaquil and Charmander. But I will need to breed the new babies and I won't be available to do this until tomorrow or Sunday, depending on when you are available. If you don't have any of those, that's OK. Make me an offer and I'm sure we can work something out. @ Danger-- I've got a legit shiny Rapidash on my Diamond version, and the red Gyarados but you probably don't want that. If you do it's not a problem though. Other than those two I can honestly say I have no other shiny pokemon. I never chained for them or anything like that. I catch what I can basically. I figure if I really want shinies I'll just breed for them. @ Trion--I can breed you a Turtwig and I think a Treecko, if not I should have a Wailord I can breed for you. That's on my Diamond version though. Also, while I'm mentioning what pokemon are on what versions I ought to explain that if you're getting pokemon from my Diamond, then if you've got junk pokemon that don't want, like Rattata or something, send it over for what I'm sending you, and then I'll do the same thing when you're sending something like a Charmander over to me. If that doesn't make sense to anyone then I'm not sure how else to explain. I'll get the Charmander ready tonight. I already have a Cyndaquil. My SS friend code is 1506 1906 6324. What are yours, and when would you like to do the trade? The name for both of those is Elrik. Is there anything else you're looking for? 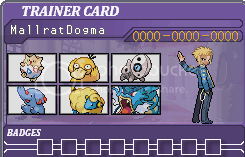 I don't have the Bulbasaur and you're getting the Torchic from Dangertrout. Squirtle or Mudkip if you've got them. What about you? Anything else you're looking for? Do I just put Trion as the name on the pal pads? I can do a Squirtle easy. I've got a metric ton of the little guys. And the things I've listed are the things I'm looking for right now, but I'm always open to other offers. Why don't we stick to the three we've agreed on for now and then when you're done with me and Dangertrout, feel free to send me a PM and we can discuss further trades. Actually, since Dangertrout only wants shinies, then they might not want to trade with me. Because I apparently gave that Rapidash away already, I just forgot. So the only shiny I do have is the Red Gyarados. As for you Trion that's fine. Since it's an even three. What does the Pokerus symbol look like on Diamond? Because I've got a Kyogre that has a symbol that kind of almost looks like a frowning smiley face. If that's the pokerus symbol then you can have the Kyogre if you've got anything for it. The Pokerus virus is indicated by a status effect symbol much like sleep or poison, only this says PKRS in purple. The smiley face indicated that the Pokemon has had the virus but it's no longer active and can no longer be spread. I'm looking for a Pokemon with an active Pokerus. If things don't work out with Dangertrout, let me know. I can do the Torchic but not the Bulbasaur. I can also breed a Mudkip. So if you'd like that, I can do it too. If there's nothing I'm looking for, just give me some idea what you've got and I'll pick something. Give you an idea? Well pretty much everything thats on my Diamond version is junk persay. Since I'm focusing on my SS. And this is a long list of junk just so you know. That's about it. If you see anything that you like, just let me know, it's like I said, Pretty much everything that's on Diamond version is junk. If it's all junk to you, I'll happily take the Dialga. I need one since my copy of Diamond got lost. from your copy of Diamond. I'm going to suggest we do this tomorrow at 4pm Eastern Standard time. Let me know if that works for you. I'll send you a PM arund that time to let you know I'm ready. I'll agree with you on the time and everything like that. And yes you're right about the pokemon and where they're going to. The reason all of those pokemon are just junk to me is because i don't have a second ds of any kind to send them to my SoulSilver. And the fact that I'd prefer Palkia to Dialga, why didn't i get Pearl then? Because Diamond had the non-legendaries that I was looking for, like Rampardos. And frankly I'm not going to even attempt to restart Diamond until all the pokemon people want are out of the game. Great. Talk to you tomorrow. Okay, so I'm looking for someone to help me out, I'm wanting to restart my SoulSilver file, and I need someone to trade my Event Raikou and Lugia to who I can trust them with, then when I'm at the point where i can trade for them back, that's what I need to do. Is anyone willing to help me? If anyone is willing to help me I'll be more than happy to give you something from my Diamond version for your help, and the only thing I ask is that whoever does decide to help me, doesn't touch Raikou or Lugia's attacks or items [if they're holding any]. Pacific Time Zone (UTC-8) and I work graveyard. So the best time to contact me is 8am-12noon(I might be working outside) or 8pm-9:30pm Mon-Sat. -I am a Shiny Breeder and can breed one if you PM me. Okay great, when would be a good time for you? Refer back to it and let me know if anything interests you. I'll take all of those if you don't mind. but maybe you could also trade a cubone to me with an everstone? No, I don't have Glameow or a Razor Fang, got anything else you want? On which version? I mean I'm looking for more direct trades at the moment, things going straight to my SoulSilver, but if there's anything on the Diamond list you want, just lemme know.